NOTE: All content is for informational purposes only. It is not intended to be a substitute for professional medical advice. Some shampoo contains cancer-causing chemicals that can strip hair of shine and luster. That’s why more people are using natural shampoo alternatives. There are several reasons people use natural alternatives to conventional store bought shampoo. Here’s one you probably wouldn’t think of: germs. What do germs have to do with your hair and shampoo? Everything. Your body contains approximately 10 trillion more bacteria than your own body cells. When you wash your hair everyday, you strip away the good bacteria. Using a natural shampoo alternative can help preserve the good bacteria that calls the top of your head home. Similarly, more people are realizing that it’s not good to use hand sanitizer for the same reason. Hand sanitizer weakens your immune system because it kills good bacteria. It also gives you less exposure to bad germs that your healthy immune system would otherwise be able to fight off. Some people who swear off shampoo (the movement is called “No ‘Poo”) go several days, if not weeks, without washing their hair with shampoo. If that seems extreme to you, try some shampoo alternatives, such as dry shampoo. Dry shampoo is simply, as it implies, a shampoo in powder form (that you spray into your hair and later brush out) without water. It might seem like a recent beauty trend, but it’s actually been used for centuries. Dry shampoo works by absorbing excess oil from your hair. There are plenty of dry shampoos you can buy. But many dry shampoos are no better than regular shampoos. They contain preservatives and harmful chemicals. Instead of taking the easy and potentially harmful way out, make a homemade dry shampoo. Baking soda is a perhaps the most popular dry shampoo alternative. But some people report losing hair with baking soda. It might be due to its high pH level. To balance out the baking soda, you can combine it with vinegar. You can also use talcum powder, oatmeal (in ground form), cornstarch, and essential oils. Essential oils such as lavender are used to provide a pleasant scent to the dry shampoo. Dry shampoos are not meant to be used on a daily basis. But you can use dry shampoo once or twice a month instead of washing your hair with shampoo. There are several natural shampoo alternatives you can use. Coconut oil is a perfect shampoo alternative. Because it’s rich in lauric acid, a medium chain fatty acid, coconut oil penetrates deep into the hair follicles. Coconut oil also repels water. This is a good thing because the water could otherwise damage your hair. Coconut oil used as an alternative hair treatment can prevent your hair from becoming too frizzy. Another shampoo alternative you can easily use is aloe oil. You probably know that aloe is used to treat burns and cuts. Aloe is effective because it helps regenerate skin. Likewise, aloe can also help rejuvenate hair follicles. Simply wet your hair in the shower and rub some in. You can also use essential oils as a shampoo alternative. They have been used for centuries by traditional societies for hair. Shikakai is another alternative shampoo treatment. It’s still used widely today in India for fine, dry hair. If your hair is oily, you can also use clay. Multani mitti, aka Fuller’s Indian Earth Clay, is also popular in natural health circles for its use in face masks. The clay one of the best natural ingredients to soak up excess oil in your hair. But, it won’t strip all the oil away. You’ll still have some shine to your hair. And, clay won’t leave your hair looking brittle. That is, unless, you’re hair is already super dry to begin with. You can also use avocado oil as a shampoo alternative. Avocado oil high fat content helps penetrate hair fibers and moisturize them. A few other alternative shampoos include Dr. Bronner’s castille soap, soap nuts, honey, apple cider vinegar, blackstrap molasses and lemon juice. People with fine hair have trouble finding a good conventional shampoo for their specific hair type. Especially one that won’t make their hair less elastic or dull than it already is. All natural alternatives are no different, though. Some all natural shampoo alternatives work better for people with thick, curly hair. Some of the alternative shampoos mentioned above work on both fine and curly hair. Honey is a natural hair remedy for all hair types. Aloe vera also works on fine hair. Approximately one or two tablespoons of either honey or aloe vera is all you need for an alternative shampoo for fine hair. Simply apply to the scalp and let sit for several minutes before you wash it out. Baking soda probably isn’t a great alternative shampoo for fine hair. But for more substantial textured hair, it can work wonders. As long as it’s not used too often. Almond oil mixed with cucumber is one shampoo alternative for curly hair. So, too, is coconut oil. Or shea butter mixed with your favorite essential oil. Rice bran oil, grape seed oil, carrot seed oil, and countless other all-natural ingredients can help condition your curly hair. And isn’t it great you can pronounce the ingredients in your alternative shampoo. Take a look at the ingredients label on your conventional shampoo bottle. Chances are, there’s several ingredients you can’t pronounce. Those are the ingredients (Cocamidopropyl Betaine, for example) that have given rise to the popularity of the No ‘Poo movement and alternative shampoos. Aloe Vera for Hair Growth: Should you give it a try? Marula Oil for Hair Growth: Does it really work? Jamaican Black Castor Oil: Is it Better for Hair & Skin? 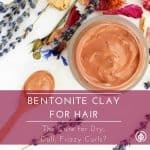 Bentonite Clay For Hair: The Cure for Frizzy Curls? Your opinion is good which you share here about natural shampoo alternatives for curly and fine hair.I truly love how it’s easy on my eyes as well as the info are well written. I was fortunate to find this site when I was looking for some info on Google. STAY UP TO DATE WITH ALL THE LATEST STRAIGHT TO YOUR INBOX EACH WEEK! Nootropics: Can These ‘Smart Drugs’ Really Boost Brain Function? Allulose Sugar: A Better Low Carb Sweetener? Are Garcinia Cambogia Benefits for Weight Loss Safe? Rick Simpson Oil: Is It A Miracle Cure For Cancer? Echinacea Tincture: Effective Cold Killer or Hoax? Essential Oils for Muscle Pain: Better than OTC Drugs? Copyright ©2019, All Natural Ideas. All Rights Reserved.